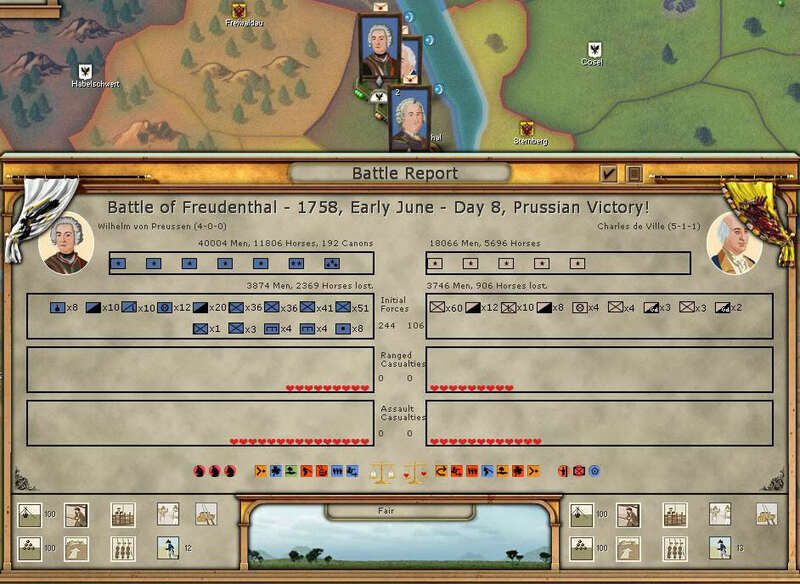 As many of you have already read in this forum, Rise of Prussia (ROP) is the new game from the french based studio AGEOD, now owned by Paradox Interactive. 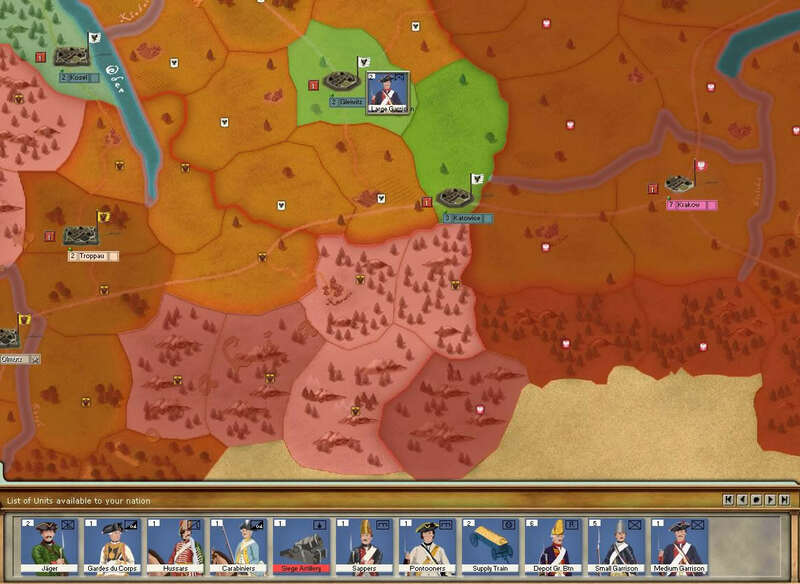 The game is a historical strategy simulation that recreates the seven years of warfare (1756-1763) that shook the continent of Europe in the 18th century. 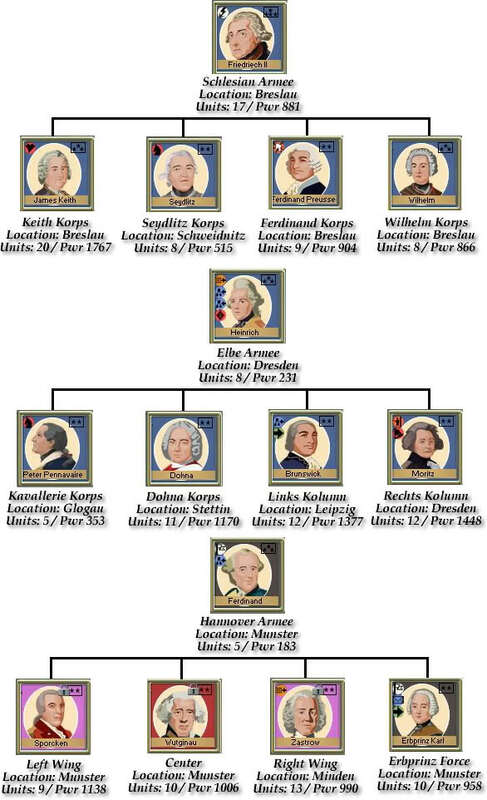 The player can assume the role of military and political leaders in command of land and naval forces belonging to either the Prussian Kingdom or nations opposed to Prussia (Austria, Russia, France). 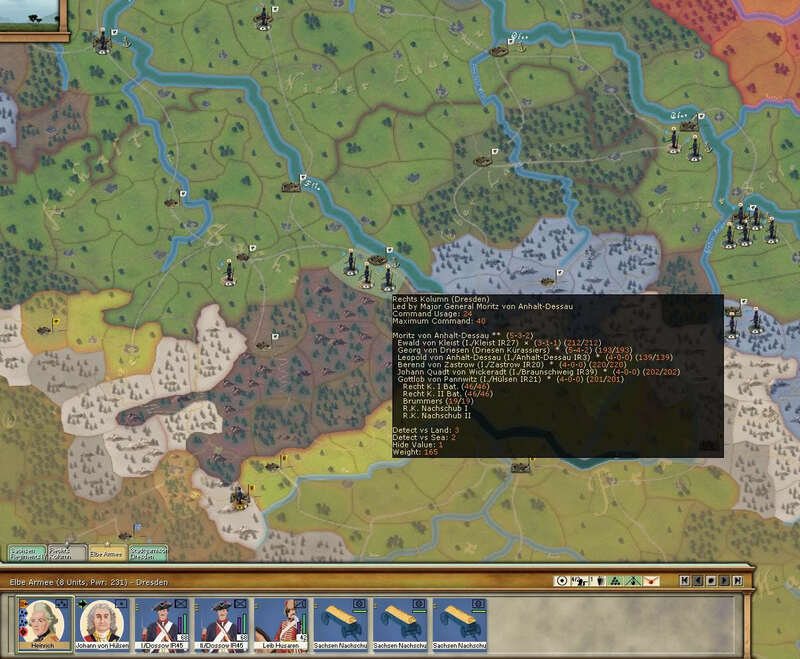 The engine uses a system of simultaneous turn resolution, so you can expect a slightly different experience from the usual "Real Time" feel from games that are released by Paradox, like Hearts of Iron or Europa Universalis. 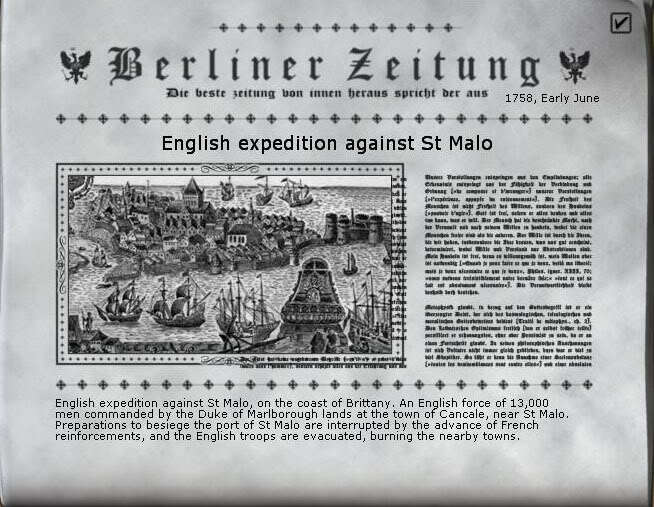 The game offers the posibility to start the campaign from the very beggining, with the Invasion of Saxony on 1756.... but we do not want to do that right now, we want to get directly into the action. 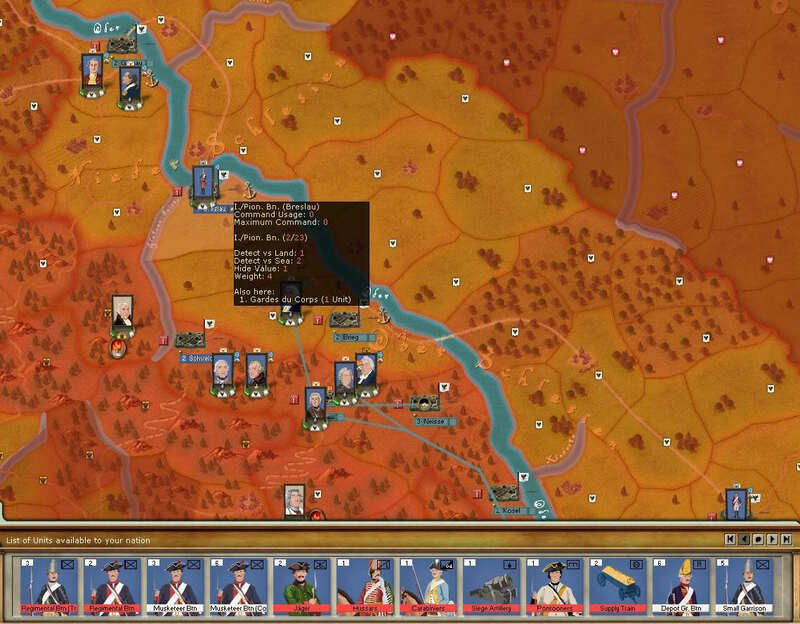 So, the best option to do that is to go directly to 1758, when the prussians are fighting to survive while being attacked from all sides with superior numbers... a battle for survival while trying to give the coalition the last definitive blow. 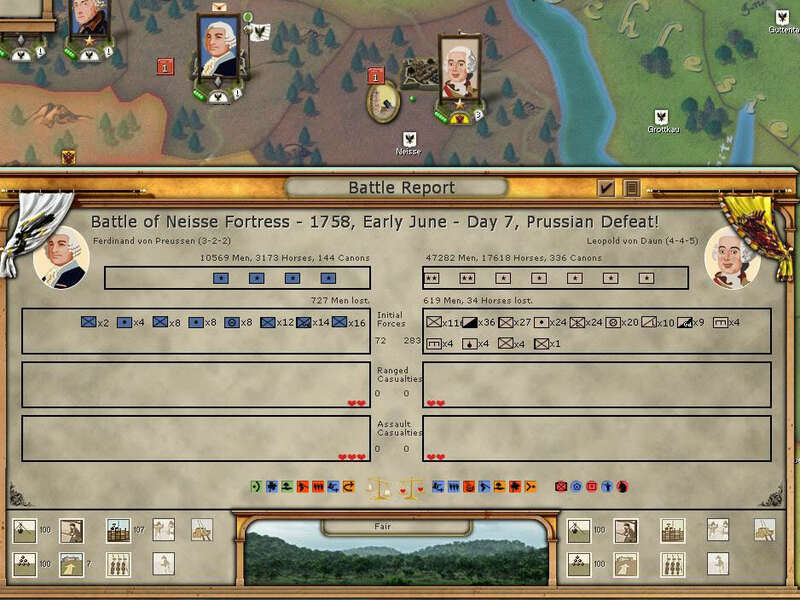 France, Austria and Russia are ready to advance and destroy to prussian invaders.. while the military genius of Friedrich must use the superior prussian discipline to his favour and turn the tide. We will start the game with 3D models for the units so you can take a look at them now. But later we will change it to the 2D models, because I like to see the "faces" of my leaders on the units portraits. 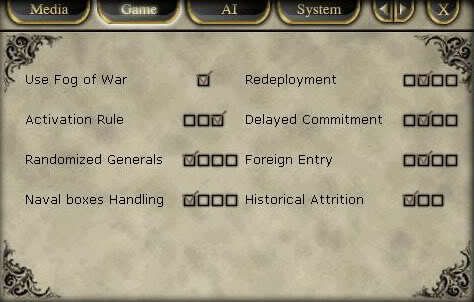 We will play with normal rules, like fog of war activated, normal attrition, etc. 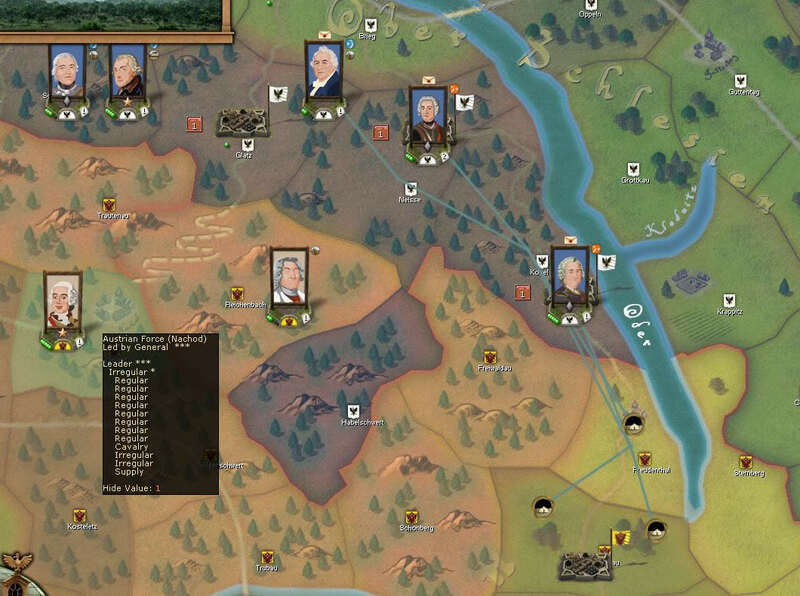 I do not like to play with "randomized generals" ON, but for replayability it is a great option... specially if you are playing a PBEM game against a friend and you want add another layer of difficulty to the experience. But in my case, I have selected the hardest option that has the added difficulty of adding a high chance of not being able to move at all your forces with a non-active commander. That's really hard in some situations... it means that if your leader is not active, your force may really starve to death or be easilly surrounded by the enemy. I think it is a very interesting option... so keep it in mind for your games. No special bonuses for the AI, the only exception will be that the AI receives more time for "thinking" in exchange of a slightly slower turn processing... something that you will not notice if you have a high end PC. We disabled Error Logging for the AAR, but I strongly suggest that you leave that checked, because you get more feedback if you want to get into the Logs files and see what went wrong. 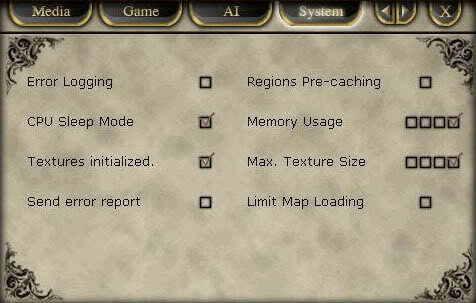 One important note, specially for "old" PCs, keep in mind that this "error logging feature" writes to a .txt file all the things that happen in the game... so, that constant writting to a file may really slow down your PC if you are running out of RAM or you do not have enough processing power. I always keep this active... and I recommend you the same... but be aware of the posible slowdowns for "oldies". I will not explain each one of them, because I am sure you want to get into the game right now... but if you want to know the details of each one, don't hesitate to ask. 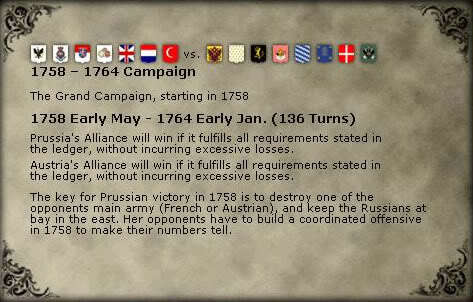 The scenario represents the historical situation of all the factions on this date, Early May of 1758. 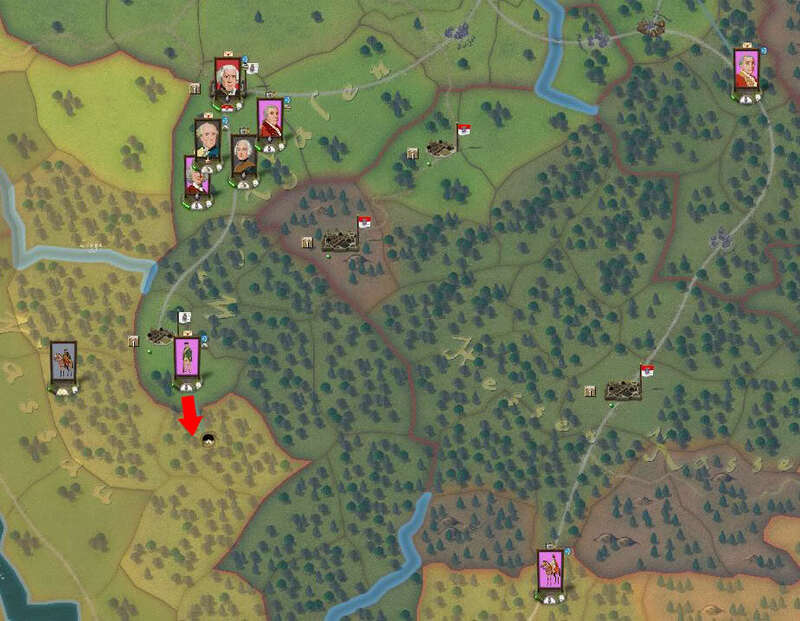 So, our forces are already spread around the entire map into their historical positions after the early battles took place since the last two years of the conflict. But as a guide, it is a very useful value... specially when you can spot enemies forces and check their power this way. 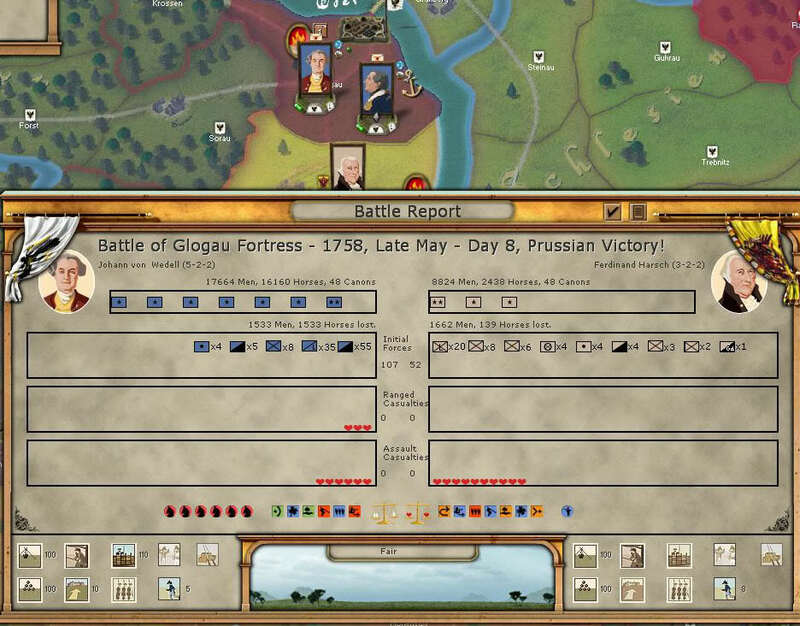 With the fight already at our gates, there isn't much time available to do a major reorganization of the army... if we try to do that right now, we will probably fail, loosing the major bonuses we have from this organization (no command penalties, etc) and we will not be ready to do any major battle quickly. For the ones reading this that are not familiar with the AGE engine, the little coloured icons on each leader portrait represent a positive or negative ability of that leader. For example, you can have a leader that it is a "Military genius" and will grant a wide variety of bonuses to the troops under his command... but on the other hand others may give a penalty, for example, someone with the "ability" Slow Mover will decrease the speed of the unit. 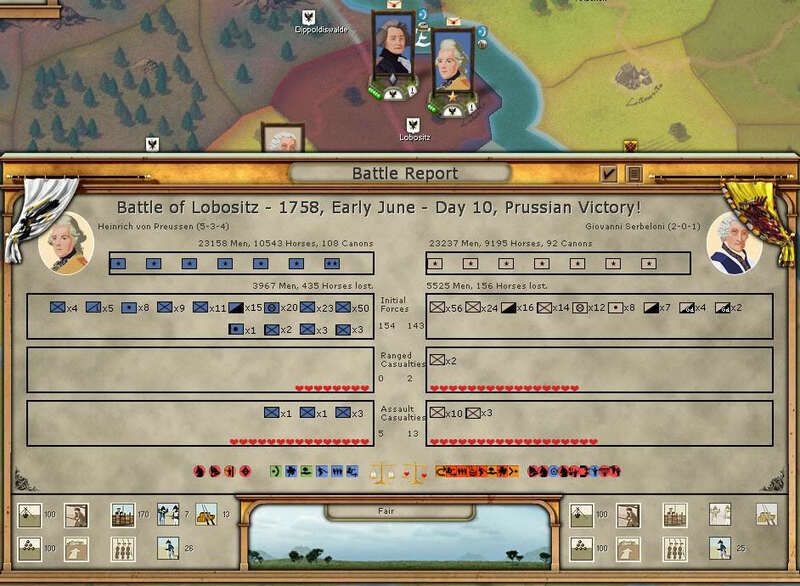 One of the key to success, specially in this case, is the good use of our superior leadership... that's the only chance Prussia has to beat the superior numbers they will throw at us. Strategic Rating: A Leader’s Strategic Rating is used to determine the likelihood that he will be considered ‘Active’ during a game turn. The higher his Strategic Rating, the more likely he will be ‘Activated’. This rating is also used to determine the Leader’s Command Radius if placed in command of an Army and the amount of Command Points he is able to bestow upon subordinate Corps and units. Offensive Rating A Leader’s Offensive Rating is used when a Leader is in command of a Force that engages in combat while assuming either an Assault or Offensive Posture. The Offensive Fire and Assault values of every unit in the Force are increased by 5% per point of a Corps commander’s Offensive Rating. The Offensive Fire and Assault values of every unit in a Brigade are increased by 3% per point of the Brigade commander’s Offensive Rating. These values are cumulative—units receive bonuses from both commanders if applicable. Defensive Rating A Leader’s Defensive Rating is used when a Leader is in command of a Force that engages in combat while assuming either a Defensive or Passive Posture. The Defensive Fire and Assault values of every unit in the Force are increased by 5% per point of a Corps commander’s Defensive Rating. The Defensive Fire and Assault values of every unit in a Brigade are increased by 3% per point of the Brigade commander’s Defensive Rating. These values are cumulative—units receive bonuses from both commanders if applicable. 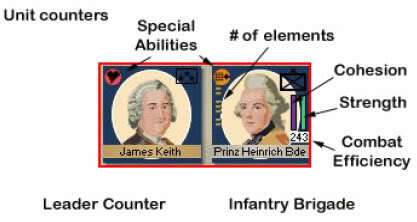 The ratings of General Keith and King Friedrich combined can really change the tie during the course of a battle, so, they will surelly lead the offensive campaign wherever we go. It is very important to always keep an eye on that... because a force with low cohesion or strenght can reduce its chances enormously in case of an attack... so we better head for cover to replenish our men in that case. As you can see now, it is one our biggest units out there. There you have all the details about the Schorlemer Brigade inside the Keith's Korps... interesting, no? That completes our first main army, the bulk of our fighting force commanded by our King. By looking at the map and the position of our forces, I noticed that the Elbe Armee group is quite small, but we have the luck of having some Sachsen Regiments in the same province, Dresden, under the command of Wunsch. So, to strenghten the Elbe Armee, we will create a new brigade with these regiments and merge them inside the Elbe Armee. Let's get to it... we select the unit containing the regiments with Wunsch. 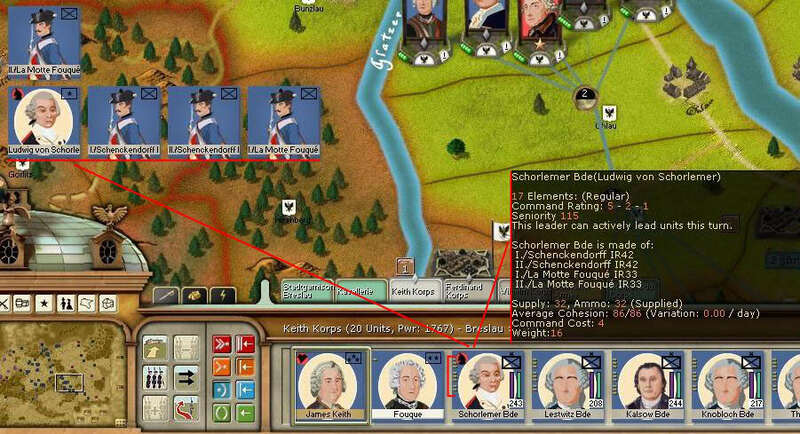 Using the highlighted button, we enable the Brigade Command for this leader to create the new brigade. With that already done, we proceed to add the regiments to the brigade by selecting them all and pressing the "+" button highlighted. The result is the newly formed brigade under Wunsch command. Notice the change of the name for the force (Wunsch' Force) and the new name of the portrait (2nd Brigade). Now with this new brigade, we merge it inside the Elbe Armee... by just drag and dropping it on the Elbe Armee unit. So, we managed to achieve what we wanted... double the size of the unit. As you can see, most of our leaders are the best of the best... with high strategic values that will keep them active almost 100% of the times... but also with good offensive and defensive values. The key to our success is to select precisely when and where to fight, so our mighty leaders are present in the scramble. Obviously, our enemy will try exactly the same, with leaders like Daum.... a leader that we should try to avoid as much as posible. Apart from this forces, we have small detachments spread around the entire map and garrison forces on major cities. Most of this forces are locked in place to secure their position, so there isn't much to do with them unless they are activated later. It is a "container ability"... just like Napoleon in the old NCP. There is no way we can win, without a proper plan... and what is better than seeing your plan come into action and succeed? So, it is time to make a plan and stick to it as much as we can. But before doing that, we will try to follow a simple premise. 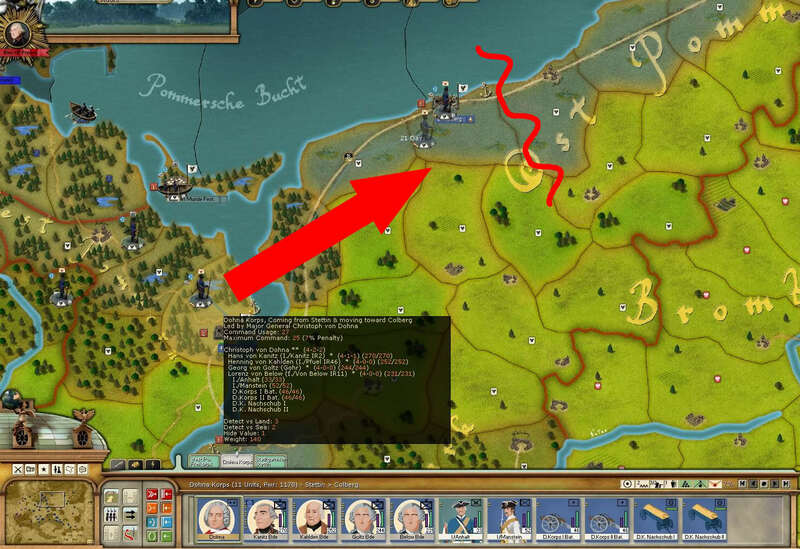 There was a lot of discussion before, during and after the design of the game, in private and in public about the "offensive nature" of Friedrich during his military campaigns. 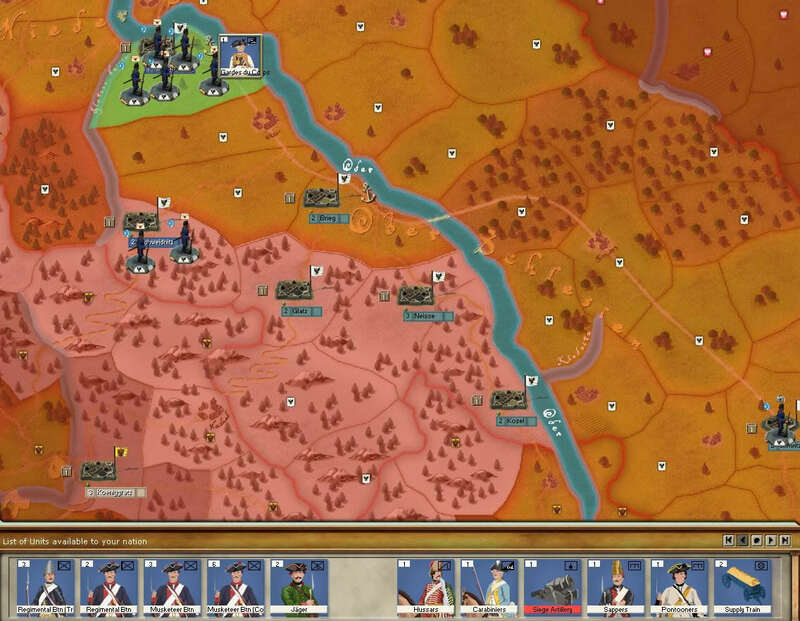 -All units around Friedrich will try to take offensive actions whenever it is posible. Even against all odds. This can surelly backfire against me in the later stages of the game... but well, this is a game, and we are here to have fun... even if I loose, the idea is that you read something interesting. The important sections are highlighted in red (that doesn't mean that you shouldn't look at the rest, obviously). Sudden Death is OFF for this scenario, so that means that if I reach the 200 NM threshold, I will not win instantly... I will have to keep playing on. I need 10 strategical objectives to win, but I currently own only 6 of them. On the other hand, in the list of Strategic Towns I already fullfil the condition, I control 15 out of a total of 30, when I only need 9. After looking at this, we conclude that our main objective should be Prag, unless we want to avoid that fortress and head for Olmutz bypassing the main austrian army... probably making a huge mistake, because we will be easilly cut off from our supplies base. But If we want to threaten Wien, we need to take Prag as soon as posible. The problem is, obviously, the ammount of austrian troops inside the fortress. We need to get more intel about that region before doing that gigantic operation. Also, our main army commanded by our King is far from Prag. Our main army led by our King awaits on Breslau. 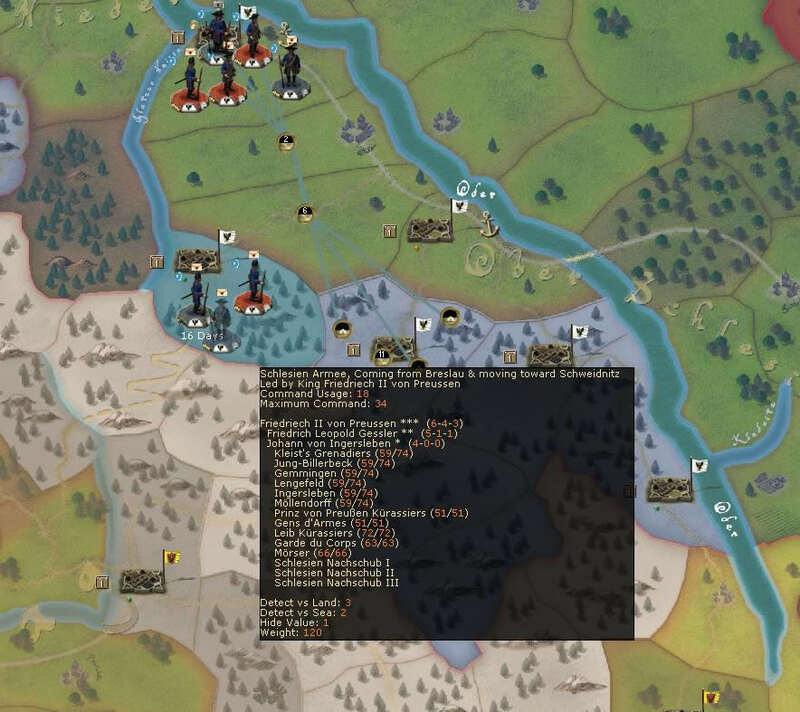 The plan is simple, Friedrich will head south to Schweidnitz, simulating a threat to Koeniggratz, while the bulk of the army under the command of Keith advances further to the south in a two phases advance. The first phase will be to the right of Schweidnitz in case the position of Friedrich is threatened. 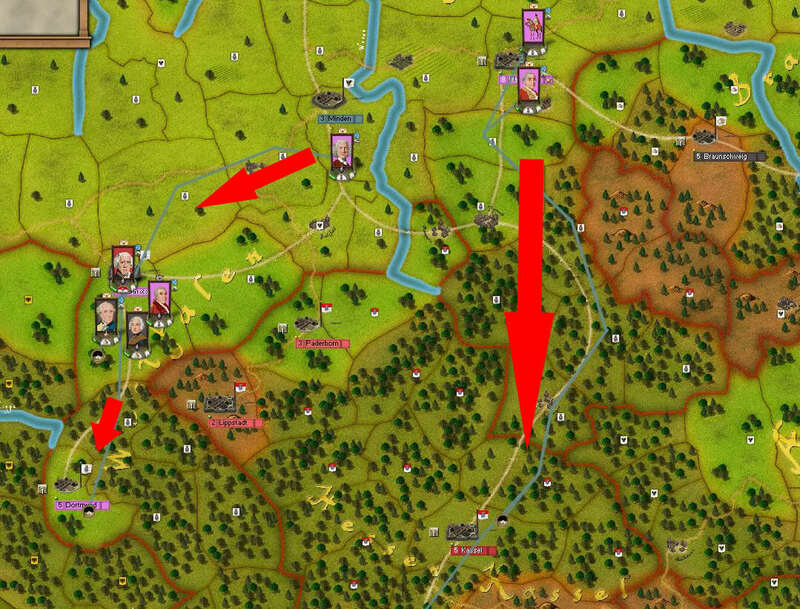 In case it isn't, they will continue the advance deep south to attack the fortress in Olmutz and take away one objective from Austria. 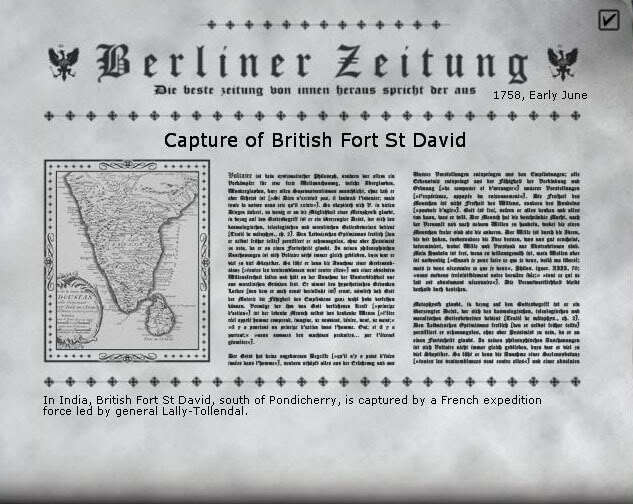 After Keith accomplish this task, he will meet at the rendevouz point with Friedrich and advance into the Koeniggratz fortress. While Keith is advancing, all the forces at Schweidnitz must hold their position waiting for the Keith's Korps (including the King). In Dresden the Elbe Armee doesn't have enough forces to storm the Prag fortress directly... or at least, that's what he High Command thinks. So, their orders for now are to try to make a divertion for the Prag's forces, so they come out and fight outside the fortress protection. Probably they will not fall in the trap, but at least, we will make the austrian forces beleive the threat is coming from Dresden... when actually the big force will come from the other side. 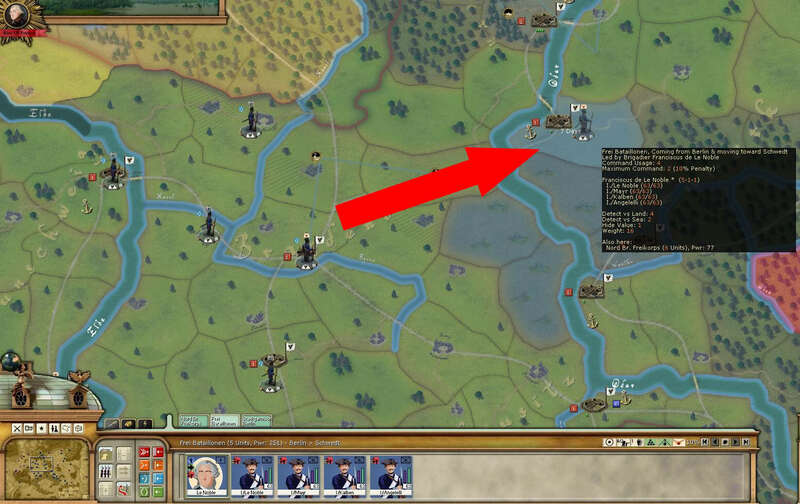 By no means the Elbe Armee must cross the river. That should create a natural barrier to try to survive in case of a surprise attack from Austria. On the far left, you can see a small detachment force that will be fortified in place to protect the supply route to Dresden. We do not want to be cut off before Prag falls. As you can notice here, there is a distinction between the postures of our armies (blue vs orange circle on the top right of each model)... that means that the "blue" ones are on defensive posture and the "orange" ones are on offensive posture. On the far left of the map, our allies will have a hard time trying to protect their regions from the austrian and french advances. Seeing they are far away from the "influence" of Friedrich, they will hardly commit offensive operations. They task is to hold the city of Munster at all cost. The blue lines represent the supposed advance of the coalition forces. Notice the different colour on the base of the model representing the different nationality of the stack. 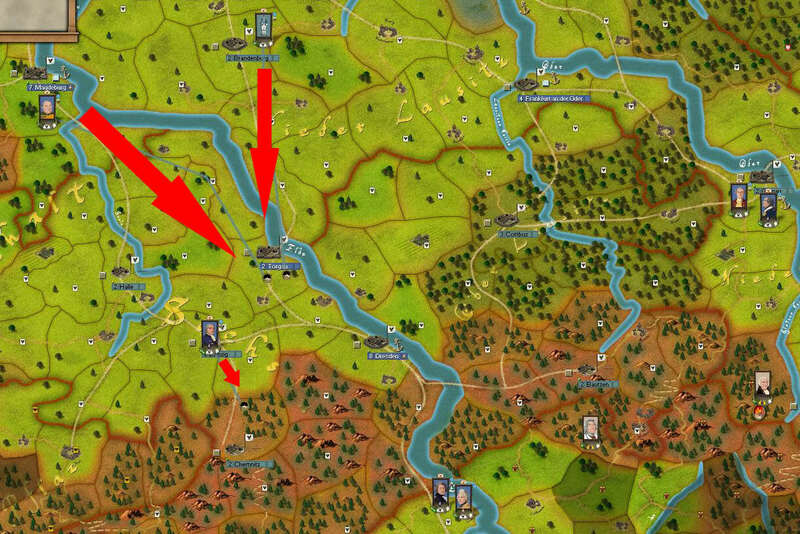 All the reinforcements around the area will head to Munster to strenght that position. Back on the north, there isn't much to show. Our situation is precarious at least... if not worst. It is almost impossible to hold Colberg from a russian attack with the current forces. So, we quickly order the construction of two new regiments to strengthen the position in there. As you can see, they cost resources and there is a limit of how much of them we can recruit. These new recruitments will cost us money and conscripts... very important men that will not be able to fight elsewhere. But, obviously, with this it will not be enough... the russians are too many, and too well trained to stop them with this small ammount of forces. So, the Dohna Korps is ordered to march quickly to join the defense of that stronghold. 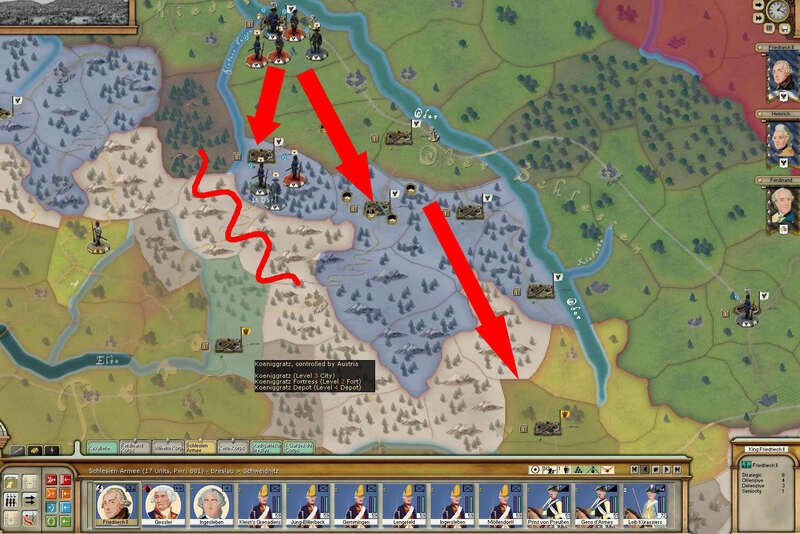 This move will reduce our forces in the south, where we will surelly need his men to storm Wien... but Colberg cannot be lost, or everything will fall to pieces. Following the same idea, the Frei Bataillonen will also head north to help in the defense of the area... there is a long way to go from Berlin. The rest of the detachments will remain in place... because we want to... or because they just can't move at all (because of different reasons, being them: inactive leader, locked in place waiting for an event, etc). could i ask you for a max zoomed in screenshot of southern bohemia, a region close to my heart? since there will be little or no action there that i forsee i am moved to this motion maybe centered on Tabor or Budweis? i am eager to see the region names. thanks a million! Check the previous screenshots, unless I am looking at the map at full zoom, you will not be able to see the names of the regions. Am I stating the obvious when I point out that Friedrich is mispelled as "FriedriEch" in the game? Marquee wrote: Am I stating the obvious when I point out that Friedrich is mispelled as "FriedriEch" in the game? Yep... it is already corrected. 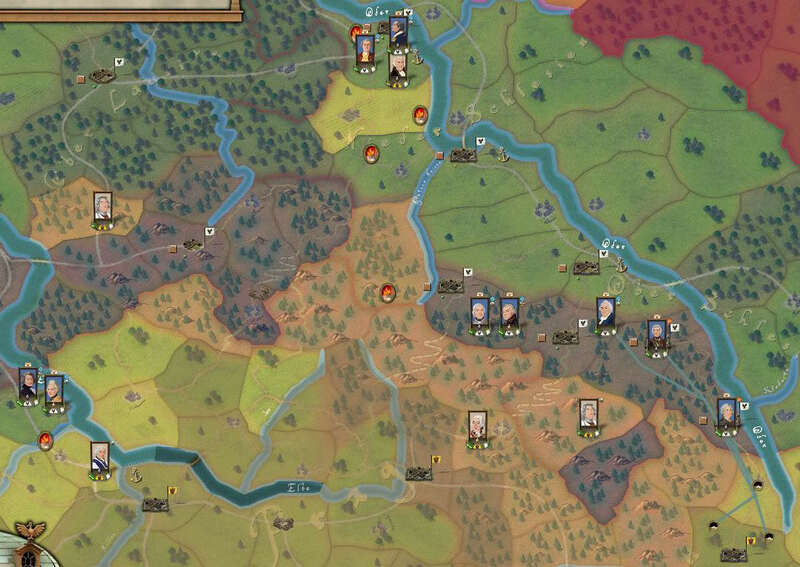 Generalisimo wrote: Check the previous screenshots, unless I am looking at the map at full zoom, you will not be able to see the names of the regions. After I pressed the end turn button, the days started to pass by and my units followed the orders I issued... but to my surprise, Austria started agressively by trying to reach Dresden. 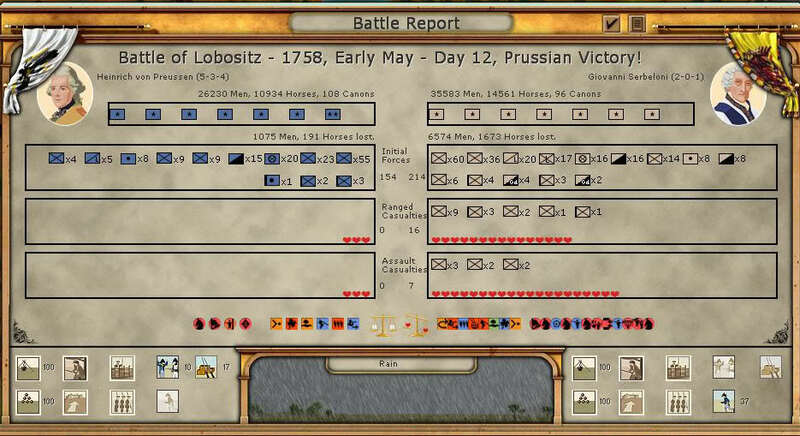 A great victory for the Prussian Army. Outnumbered by around 10.000 men, we managed to inflict heavy casualties on the Austrian Army, including the complete destruction of many elements. 1) During the course of the battle, you will see dynamic graphic showing who is actually winning the battle (inflicting more hits on the enemy). But also, a new feature recently added, is that the engine will start commenting what is actually happening on every round of the battle. So you will be informed if your men are routed, if they are running desperately, if they are supporting another column, etc. This was a very anticipated change to get more feedback during the course of the battles, so I am sure the old players of the AACW will be more than happy to hear this. 2) When the battle is over, you get that nice graphic that I posted in there. Apart from the numbers that you can see in there, you also have all those nice looking icons at the bottom. They are not there to "look pretty", they give you a lot of information about what happened. For example, I can see in there that both armies were in offensive posture. If you look at my icons, the 4 on the left represent the abilities present on my army at the battle (taken from the leaders or special units) and the ones on the right represent combat stats like luck, initial firing rage, benefit from favourable ground, etc. Each icon has a nice rollover text that will be self explanatory, I will not get into them here... that will take forever. In there you can see round by round what happened to each element of your army. 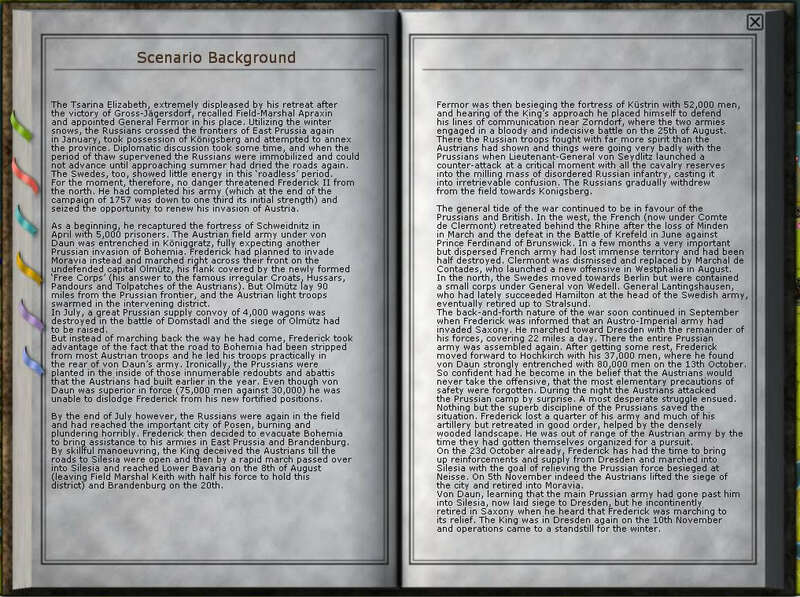 Again a muchly anticipated feature that will surelly be loved by most of the old and new players of AGEOD games. As you can see, with those three parts you can really get an idea of what went good... or wrong during your battle. We can read in there that thanks to our victory, some leaders got their seniority increased. Also, you can see the ammount of equipment captured... that will really come handy. So, now that you have seen what happened during the first encounter... let's see what we will do next in the upcoming turn. In the Southeast, we will keep advancing towards the south, while our King awaits for the austrians to attack him in Schweidnitz. In the North, the plan continues... most of the forces are gathering around Setting, while Dohna's Korps maintain his advance towards Colberg. Seeing the speed of their advance, we can supose that they are composed of light elements or mostly cavalry... so, they are not much of threat right now, but we must be careful so they do not wreak havoc behind our lines, destroying our supplies centers. 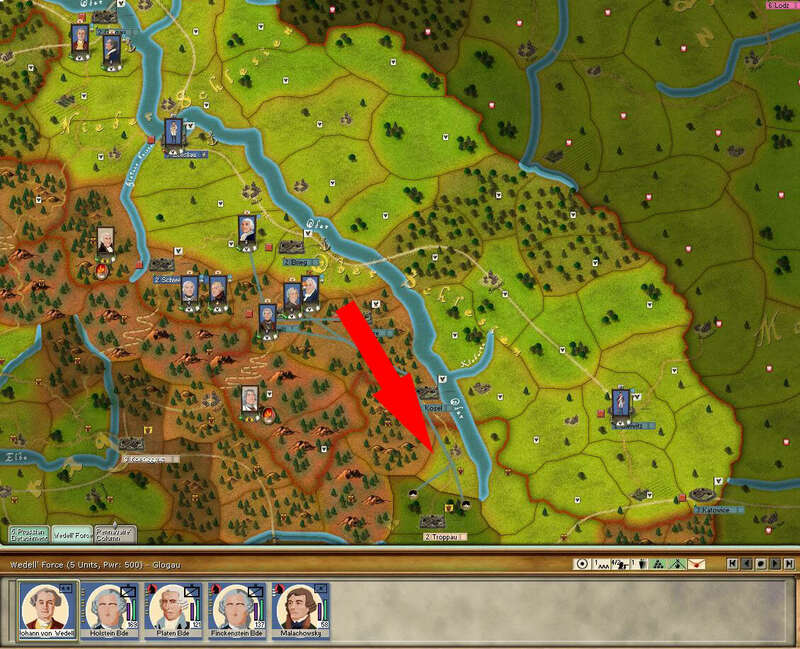 In the Center, we decide to start sending some new forces to the area of Torgau, that will later go to Dresden. With the recent fight to the south of Dresden, it looks like Austria is coming this way, so we must be prepared for the worst. In the West, the french are nowhere to be seen... at least for now. So, we maintain our plan of gathering all around Munster. A new calvary raid is sent to Kasel to see if they are coming that way or they will go for Dortmund. We will also send some light forces to Dortmund to collect more info about the area. Sadly, we do not have the posibility to recruit many units per turn... we could start training replacements for the future, but for the moment, we will avoid that. A new Pioneer unit is ordered in Breslau... this unit will later help during the siege of Koenigratz. We are ready to hit the end turn button now... and see what happens... and good news come from the front!!! We hit them badly, again, but this early encounters were not expected... 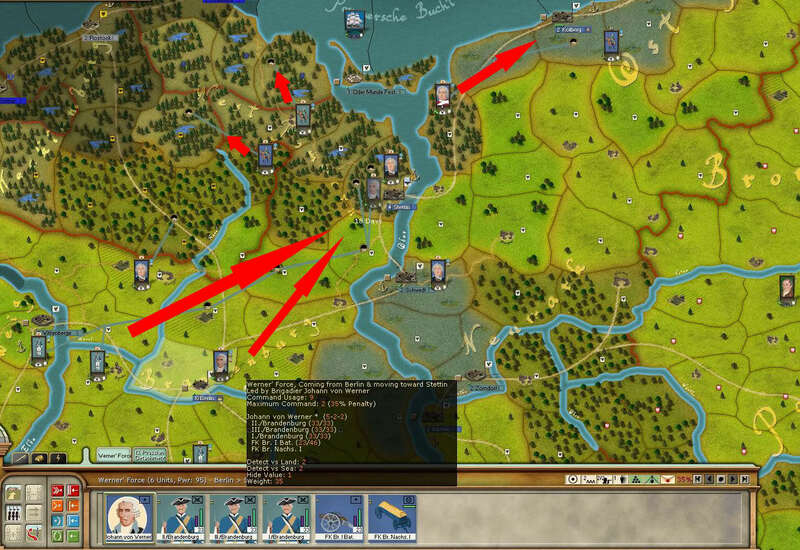 I am not so sure that the Elbe Armee will be able to hold the line if they keep coming this way. 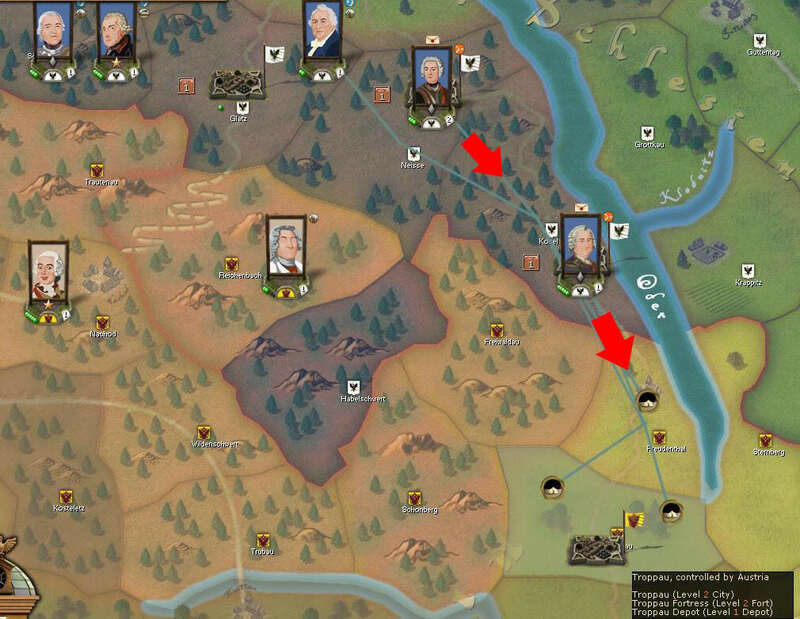 But surprisingly, the austrians try to make a deep raid into our territory, something that was not expected. 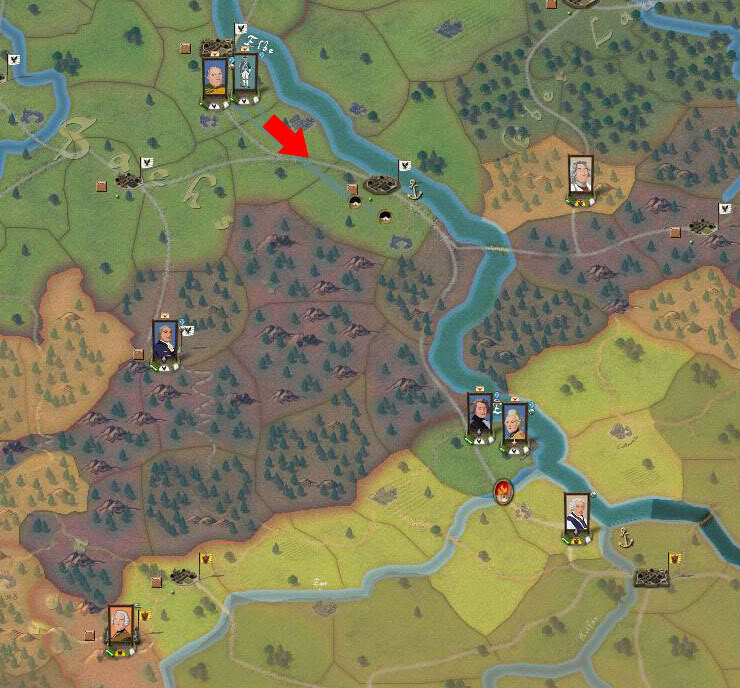 You may have noticed in some previous screenshot that there was an austrina force near Schweidnitz, I thought they were coming the Friedrich's way... but nope, they headed north, to the Glogau Fortress. Our forces were ready ... but they were composed mostly of cavalry elements. I was gathering cavalry in that region to send it later to the south. Thanks God they were there to help defending the fortress. 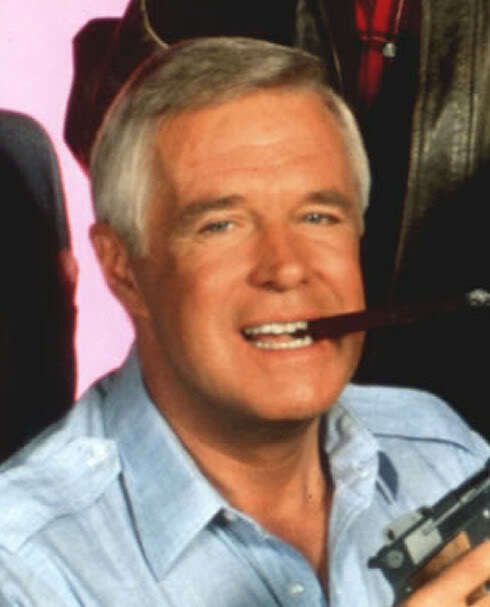 The composition of Wedell's force was a mess, I was not prepared for that. The only cannons present from my side were the ones from the fortress. I like the new battle report screen, very cool, I'm looking forward to ROP's release, less than 2 weeks now,have we got a price yet? 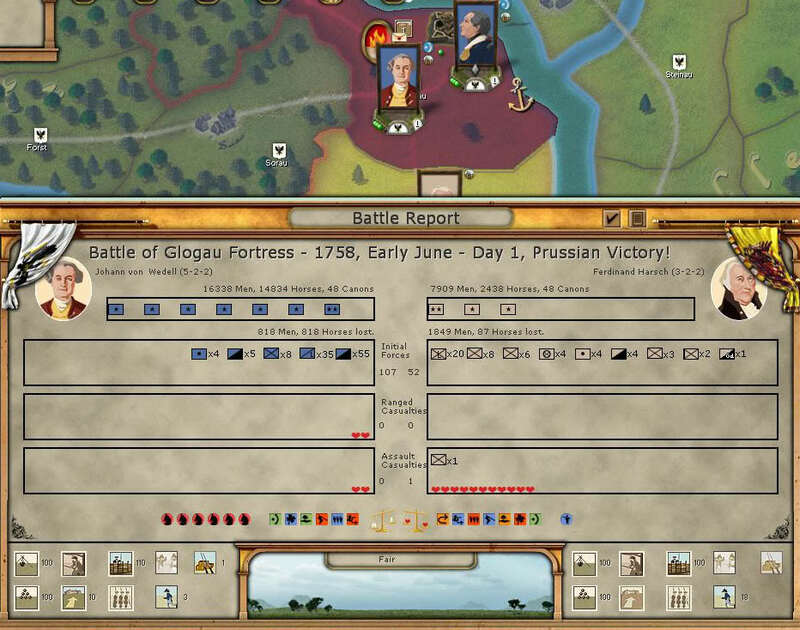 Longhairedlout wrote: I like the new battle report screen, very cool, I'm looking forward to ROP's release, less than 2 weeks now,have we got a price yet? But I suppose (read carefully: I SUPPOSE ) it will be just like any other major release of Paradox. I would really preffer to see an AACW2 with a lot of new features (these, but also new map, new regions, etc). There are many things that I didn't commented before and I think that some of you may have already wondered... specially the ones that haven't played AGEOD's games in the past. Those are mostly, national morale, victory points, war supplies, Thalers (the money), conscripts, etc. These are all national assets and are all stored at the faction level. That means that PRU has its own, and AUS has its own. I had more VP (victory points) than Austria, but less NM (national morale) than them. This is really a handicap, as you will see later. But where are them? where I can see how much VP or NM I have? Again, like in almost every interface in this game, a nice tooltip will explain you what does each number mean and how they work. As you could see already, everytime I ordered the recruitment of a new unit, some resources were consumed from that pool. 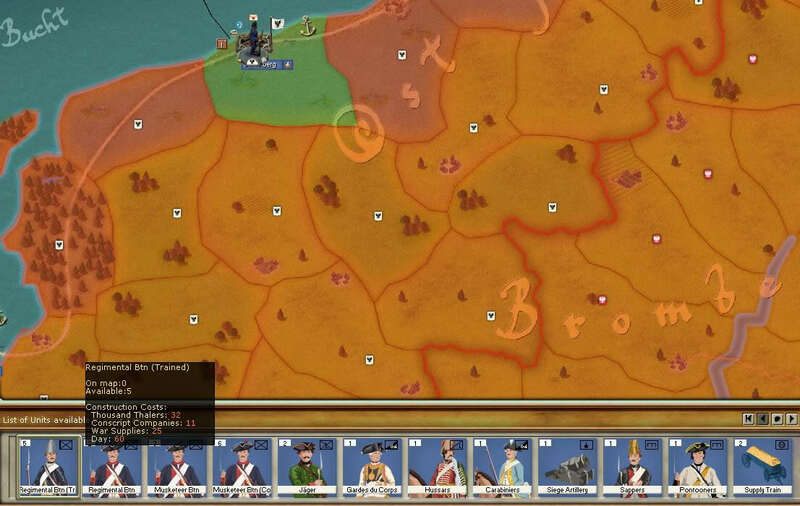 For every big battle I won, some resources were added to that pool (muskets, supplies, etc). But how do I earn more of them?... easy, read the manual, it is all explained in there. Ok, since you do not have the manual (yet! ), I will give you a preview about the concept behind them and how they work... for all the details, you will have to get the game. 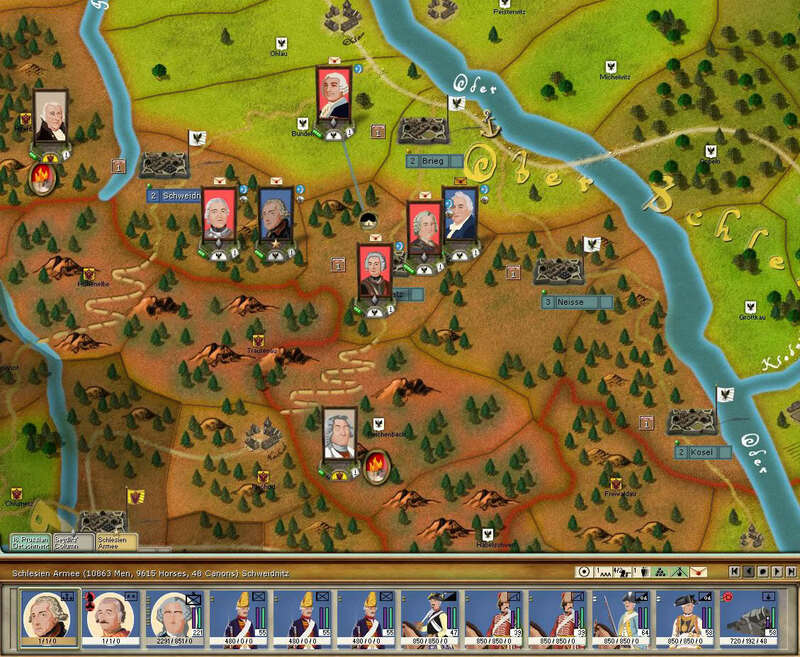 Victory Points are earned and accrued each turn for such things as holding important locations on the map, achieving goals as set forth by individual scenarios, and by destroying enemy units. 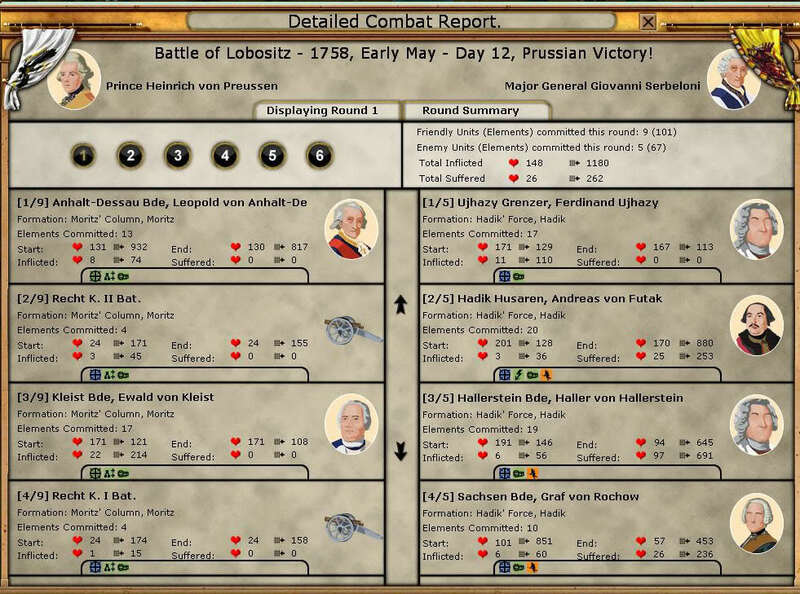 A running total of a player’s current Victory Points is displayed in the top left corner of the Main Screen. National Morale is used to represent the willingness of a civilian population (and its military forces) to ‘continue the fight’. Having a high National Morale total indicates that a populace is more inclined to support the war effort; a low National Morale total is an indication that the people are close to giving up. In game terms, a high National Morale may trigger an Automatic Victory while conversely a low National Morale may trigger an Automatic Defeat. National Morale is also used to modify unit cohesion, the production of supplies, and the accumulation of money. 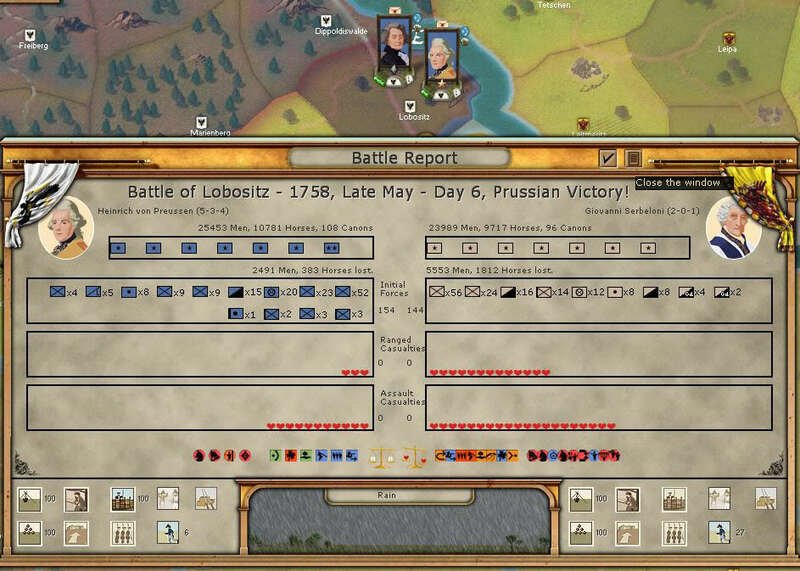 Winning a scenario by reaching the Automatic Victory threshold should be viewed as a Major Victory whereas winning by virtue of having more Victory Points is a Minor Victory. Engagements Points are gained from the strategic and objectives cities that you hold during a turn. Most of the time, you can use this points to buy new military options (like new recruits, or special brigades from your allies). Concripts Companies: Except for a very few places which raise a minimal amount of recruits every turn, the only ways of recruiting more men is through the play of options. Men are needed in order to raise new units. Money: Money is produced each turn in a few places such as your national capital or key financial or commercial centers (e.g. major ports), but those sources of income are marginal. The great bulk of your income will proceed from exceptional events. Supplies: come in three varieties in ROP. Cities will produce these three kinds of supplies each turn depending on their size. -War Supplies: This is a general term representing the equipment needed by your troops. Artillery and Cavalry cost lots of War Supplies, as they require industrial capacity, horses and raw materials. Infantry, on the other hand, costs fewer supplies, as muskets and other light equipment are easier to manufacture. 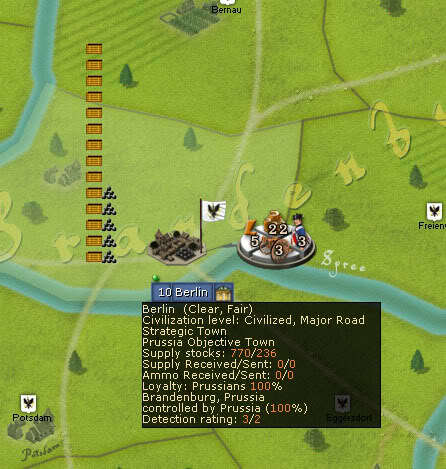 -General Supply: Armies need food, clothing, and other basic supplies to keep on moving and fighting. These are all grouped into the term “General Supply” (as opposed to “War Supplies”) and are distributed to your Depots and your troops every turn. 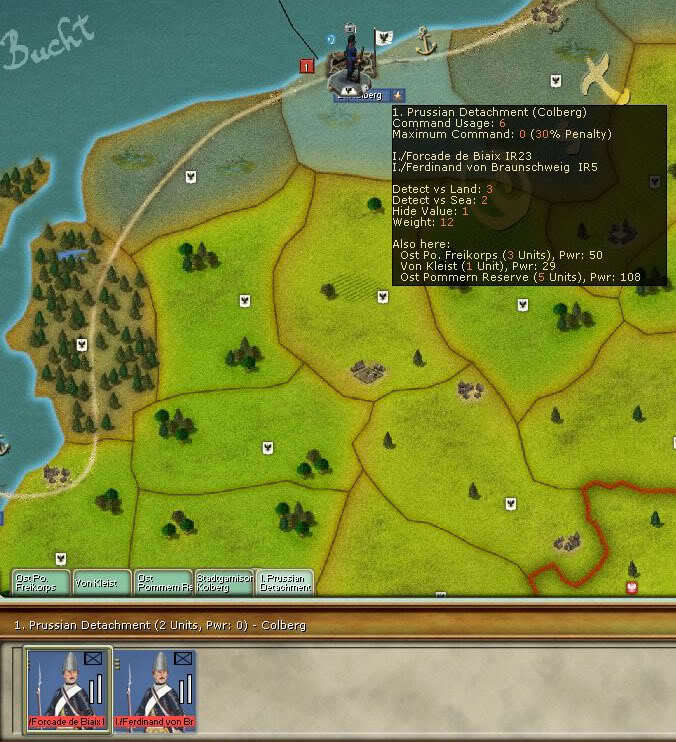 -Ammunition: Finally, another commodity you will need to keep your troops battle ready is Ammunition, which is tracked separately from General Supply but otherwise follows the same production and distribution mechanisms. Apart from the special supply system (that was explained before by Pocus), most of these things come from the center of your society, the big cities. In most of the cases, these are the objectives of the scenario, like Berlin, Prag, Wien, Dresden, etc. 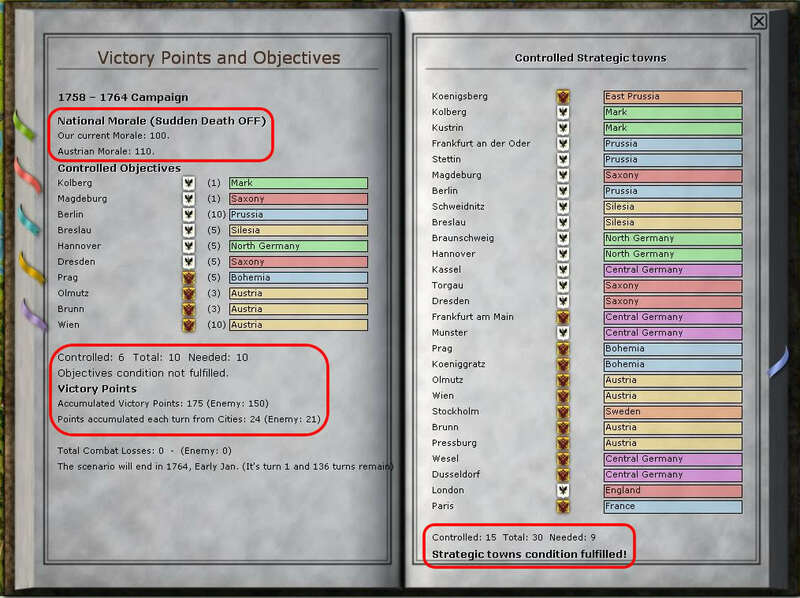 So, the one that controls those key points, usually has the upper advantage during the long campaign. Then, the little crates or boxes show you the General Supply stored in that location, and the cannonballs obviously mean the Ammunition Supply. As you can see, if you leave the mouse over the city, another tooltip gives you even more info about it. 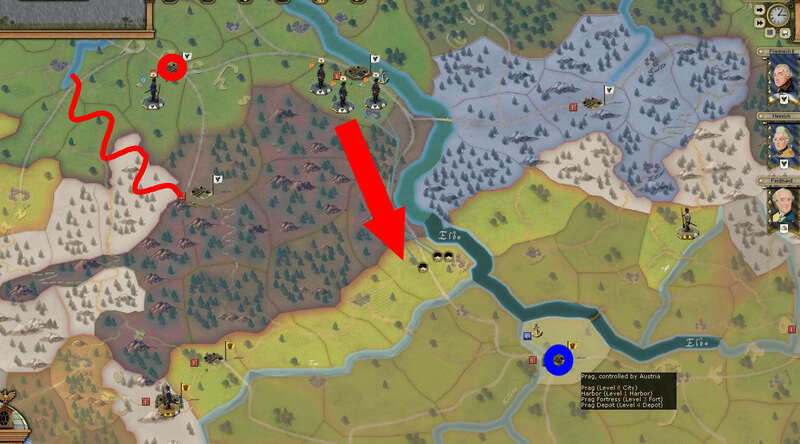 Everything you need to get your hands on the supplies is there... so, I am sure you will use this map filter more than once during your campaign. After all this, you can see now why I said in the beggining that having a lower NM is bad for my nation, or more generically, having a higher NM than the enemy gives you an edge over the enemy... and not a small one I must say. For example, your forces are recruited quicker, the efficiency of your forces is increased, your production of supplies and assets is increased, your cohesion is increased, etc. For a full list of bonuses and maluses, you can check the manual later... but I guess you already got the idea? right? You just can't have all at the same time! I will be happy to see more action from the Prussians tomorrow. I hope you will win one or two decisive battles against the Austrian Coalition to stabilize your situation. I think that you can handle this especially against the Austrians in the South. 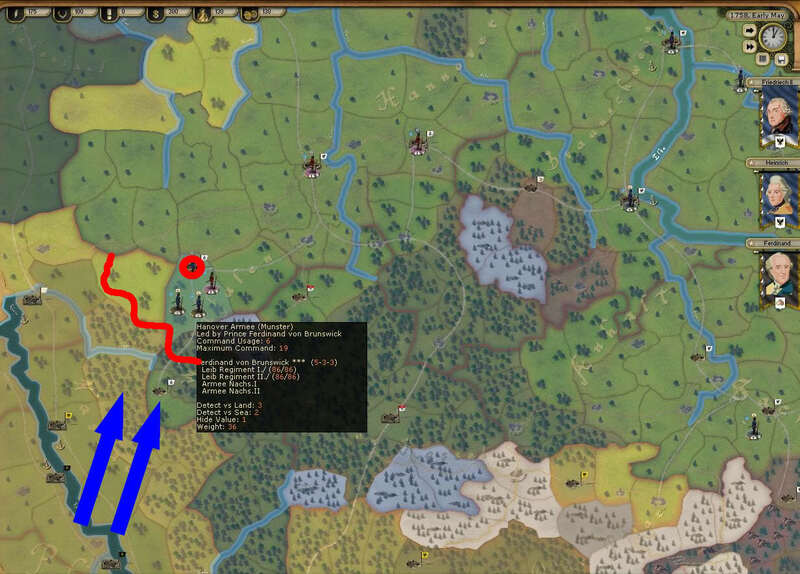 If you can manage it to defeat them by Königsgrätz and north of Prag you should be able to besiege Prag with your forces and to withstand any relief forces they could move there. Well, as promised, this update will see a lot more action than the previous one... but first, let's see the news that arrive from all around the world. As many of you may already know, this war can be considered the First World War... so, that's why news came from all the corners of the world telling us what is happening (or what happened historically to be more accurate)... but we play on this map, so let's get onto it now. 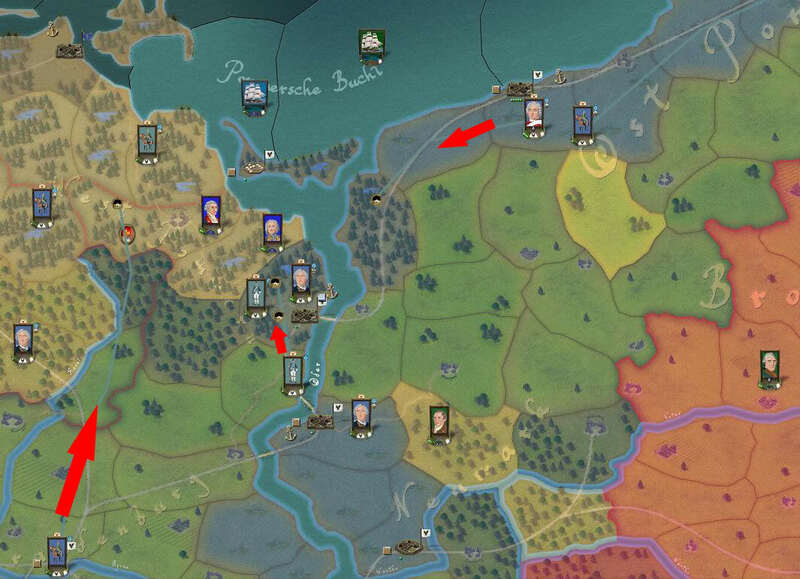 The russians start appearing, and are almost at the gates of Stettin. Just like before, we are almost certain that this russian force is full of cavalry or very light elements. Something very obvious considering their speed of advance. This is the reason why Dohna's Korps, that have just arrived in Colberg, is called back to strenght the defenses. 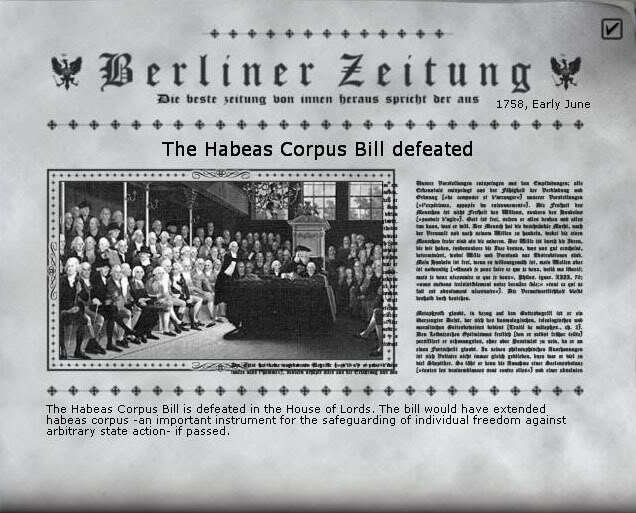 Yes, Dohna is surelly not happy about this, and neither are us... but we better be sure that we can defeat the first wave of russians. Not much to do around here. Without the troops of Keith and Friedrich, we can't storm Prag. Also, considering the recent won battles, we will maintain the position, but this time, switching to an all defense one. As you can see, more reinforcements are coming from the north, just in case that austrian detachment wants to attack Dresden. Our plan is almost ready, so we will storm quickly the Troppau fortress, to clean the way to Koenigratz... and then Prag. That's Daun's Army.... our Nemesis... we can only wonder where he will head now. This is another reason to quickly storm the Troppau fortress, before he can head this way. We are playing VERY conservative in this front... so, there isn't much to do now. We will just keep gathering information until we see some french forces coming our way. The austrian force came again for more against this fortress. A recent reorganization of the force in here, helped us to beat the austrian a bit more easilly than the last time. Our cavalry continues to defend the fortress... will they come again? Just like we predicted, our Nemesis, Daun started to wreak havoc in our lines. He storms the Neisse fortress and stops our reinforcements in there. Not a very bloody battle really, but we lost in the end. Look at his numbers... a tiny austrian army... no? Another austrian detachment met our forces in Freudenthal. Our superior numbers gave us an edge... but with a huge cost in hits. This time, our leadership failed... because the organization of these forces is not efficient nor the best. We will have to change that. But, this is understandable, because the role of these forces is for support and reinforcements. They come again... Austria seems determined to attack the Dresden fortress. I do not think we will be able to hold longer this position if they keep sending more forces this way. On our favour, Daun (like we have seen) went to the east... so at least we will not have to face him here... sooner or later, he will have to fight with Friedrich. 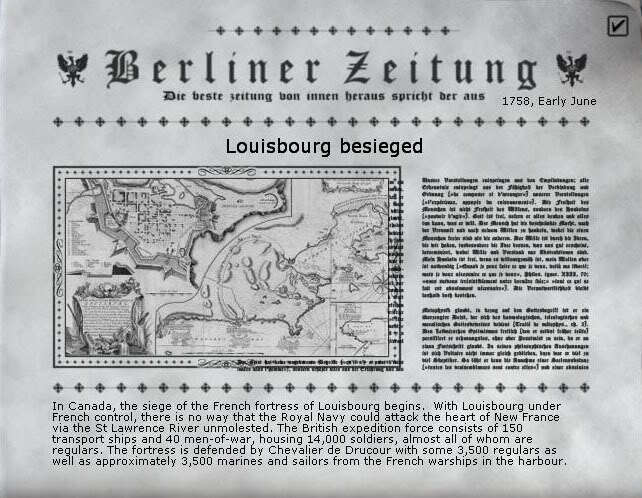 Sadly, only one of our forces reached Troppau... and because the defending forces never left the interior of the fortress, no battle happened in there. Actually, that's good for us, because the coordination failed completelly and only part of our forces would have been present in the fight... leading to an almost assured failure.